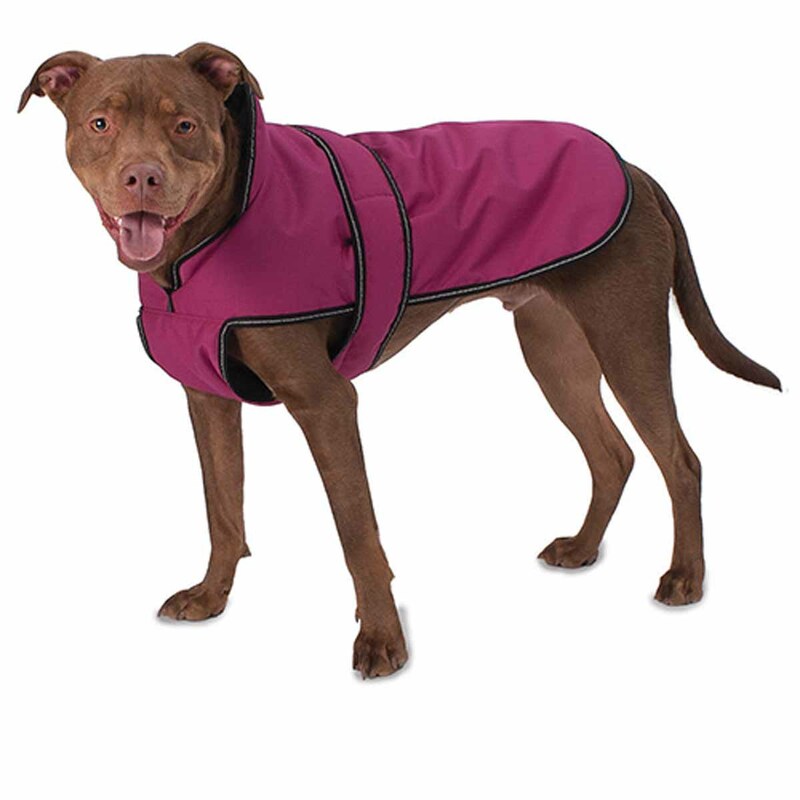 The Juneau Dog Coat in Magenta will keep your dog warm on the cold winter days! Juneau Dog Coat - Magenta Customer Photos - Send us your photo! This coat was purchased in a size XXL for my 88 pound American Bulldog, whose measurements are chest 39", length 26", and neck 24". (For comparison, the website indicates that the XXL garment's dimensions are chest 34-43", back length 26" and neck 28".) The coat is waterproof, windproof and machine washable (yay!). The collar can be worn up or down. The interior feels a bit like the texture of a coated micro-canvas (not super soft, but not abrasive either). The tag touts the coat's breathability. The coat lacks a hood, but appears very well made and seems sturdy, as though it will last for years without any problems. Best of all, it fits my large dog, whose substantial chest measurement can be difficult to fit. There is some room to spare, so if your dog is slightly larger than mine, this size may still work for him/her. Overall, this is a high quality product for protecting big dogs in rainy or windy weather. 5 out of 5 stars! Posted On 12/27/15 by Diane L from Livermore, CA Yes, Diane L recommends this product!